Bringing you all the latest news and updates about the M25 Motorway. M25 News and traffic Updates. M25 Motorway is our speciality. Welcome to the "M25 Services" page on M25 Traffic.co.uk. If you are looking for the motorway service stations on the M25 motorway this page is intended to help you find them. Below are details of each of the services available at the services around the M25 motorway together with a map of where the services are located around the M25. 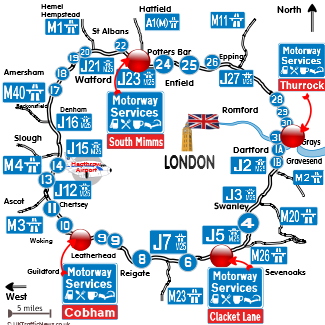 There is also a link to a larger version of the M25 services map with the locations of the M25 services on it. There are 4 motorway services on the M25 motorway, South Mimms, Thurruck, Cobham and Clacket Lane provide services such as fuel, food, beverages, shops and hotels or accommodation. So if you are need of a toilet break, a rest or some refreshment one of these service stations should be able to help. Below are details of the 4 services locations around the M25 including a maps of the locations of the M25 service stations. The services are list from M25 J5 clockwise to J31. To see a larger version of the M25 services location map you can click on the the image. M25 Traffic brings you all the latest M25 news. Todays current news and information about M25 traffic accidents, delays, congestion and roadworks. We also feature Twitter news about the M25 shared by Twitter users. Useful information for M25 users and commuters brought to you by M25Traffic.co.uk. The newest motorway services added to the M25 are the Cobham motorway services. A few of the latest M25 traffic updates are featured below. Location : The M25 clockwise between junctions J24 and J25 . Lane Closures : Lane one is closed. Reason : Broken down vehicle. Status : Currently Active. Time To Clear : The event is expected to clear between 02:00 and 02:15 on 26 April 2019. Return To Normal : Normal traffic conditions are expected between 02:00 and 02:15 on 26 April 2019. Lanes Closed : There is one of four lanes closed. M25 Traffic is an independent website that aims to bring you the latest traffic news and information about the M25 motorway. Since 2011 we have now being featuring M25 traffic updates for over 5 years. We would like to thank Highways England, Google Maps, and our users for the traffic updates they provide. © 2019 M25Traffic.co.uk. All Rights Reserved.